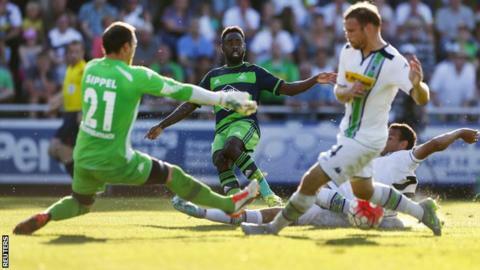 Swansea City drew 1-1 against Borussia Monchengladbach in the first pre-season friendly of their Germany tour. New signings Andre Ayew, Franck Tabanou, Kristoffer Nordfeldt and Eder all made their debuts for the Swans in Grassau. But Ibrahima Traore fired the Bundesliga side into a 14th-minute lead. Matt Grimes turned home Wayne Routledge's cross to level on his 20th birthday. The Swans play 1860 Munich on Saturday 18 July, before returning to the UK for matches against Reading, Nottingham Forest and Deportivo La Coruna. Swansea City starting XI: Lukasz Fabianski, Kyle Naughton, Kyle Bartley, Ashley Williams (capt), Franck Tabanou, Jay Fulton, Ki Sung-Yueng, Gylfi Sigurdsson, Nathan Dyer, Andre Ayew, Bafe Gomis. Subs (all came on after 60 minutes): Kristoffer Nordfeldt, Angel Rangel, Federico Fernandez, Stephen Kingsley, Neil Taylor, Jack Cork, Jonjo Shelvey, Matt Grimes, Wayne Routledge, Marvin Emnes, Eder.